Technology: Man's ability to make simple things complicated. 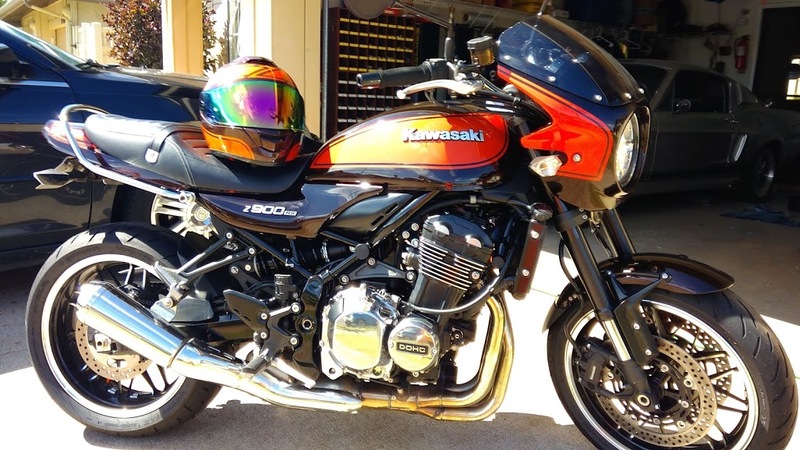 I ordered the Chic fairing painted to match the brown/orange with a smoked screen on Saturday. I was advised by email today the lead time will be pushed out a fair bit to around April. They kindly asked me if I wish to cancel or continue the order with the extended ship time. I responded that I was fine with waiting. Good choice it's worth the wait, they're really high quality and really add the looks of the RS. Mine arrived a few weeks ago but I'm fitting it tomorrow. How do I remove the headlight? Is it pretty obvious? Yes, essentially just the front screws on the headlight rind remove light and then loosen bolts that hold the headlight bucket in place and go from there. Do read my post with pics at the beginning of this thread and you will understand. A 30 minute fit on Saturday, it’s very well manufactured and fits perfectly. I fitted the SW Motech rack at the same time. That was quicker at 5 minutes each side. Order mine back in December black with matching pinstripe. They told me it would be 7 to 8 weeks plus the shipping time we're at 9 weeks now and still nothing has shipped. A little disappointed. For those of you who've had the fairing on for a couple thousand miles or more: how is it holding up? I got mine back in July and while I was checking the bike over today to get it ready to use I saw the screen is cracked in several spots. It's definitely related to stress from the mounting screws, although I'm not a hamfisted idiot and I only cranked them down to a light grunt – nothing extreme. I think there are two possibilities: 1 – The extreme cold this winter, and rather abrupt temperature shifts, may have stressed the screen out. I don't know if that kind of plastic expands and contracts much with temperature, but if it does and it tries to fight its own mounting screws I could see how it would lose that battle. 2 – More likely I just didn't notice the cracks when I put it away for the winter, and I can blame it all on the roads. I live in one of the richest areas in the country (and I so do not belong), but even though the concentration of billionaires and their Bugattis is very high the roads are positively abysmal. I went for a very short ride today just to shake the cobwebs off and even though I drive and ride around here all the time I was still shocked by the state of the pavement. It is extraordinarily jarring, even in areas where it looks flat. Back when I was in high school and my friends and I were coming of driving age and getting our first cars the roads were pretty much perfect, but they've been neglected badly for 16+ years and it shows. I sent an email to Samurider to ask if the manufacturer does any kind of warranty coverage for things like this. I'm not expecting to hear a positive answer. I noticed when I first installed the fairing that it jiggles around *a lot* on the road, and that has always bothered me. I think I will try to design some rigid fairing stays from steel or aluminum and see if I can damp all of that, and provide some support.